Lights on a level might seem like a gimmicky idea to some, but if you have ever done any leveling in a room with poor lighting (like just about every jobsite I have been on), you know what a pain it can be to read the vials on your level. The problem is then amplified if you are leveling against a dark wall. To solve this problem, I have used the light from my cell phone to shine on the vials in some situations where extra light was needed. 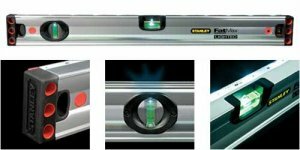 Stanley FatMax has introduced a new line of lighted levels that feature built in lights for both vertical and horizontal vials, as well as lights along the length of the level. Not to be outdone by anyone, the levels also have built in rare earth magnets that make the leveling of metal door frames, and etc. a breeze. The FatMax Lighted Levels are available in 3 sizes: 16-inch, 24-inch, and 48-inch and run on 3 AA batteries. I haven't been able to find prices or a place you can buy these except for the 16-inch at QVC, which also has a video of it in action.